Whitewater paddlers may use the bare minimumbuoyancy they can get away with to reduce bodily restriction, especially in trunk rotation and forwards / backwards movement. A Coasteerer would typically not require such levels of dexterity so ample buoyancy can be used without significant physical restriction. A kayaker entering the water in their boat from a large fall will very rarely go as deep as a person jumping from a similar heightbecause of the inherent buoyancy of the boat. Another good reason to to choose more buoyancy over less. In river paddling the aim is for a 'clean' BA, free from loops or trailing straps which pose a danger of entanglement with over-hangingfoliage or submerged hazards. There is significantly less danger of entanglement in a coastal environment so one can afford to have necessary equipment carried on or around the BA, close to hand. Whichever BA you choose, remove the rescue belt and D-Ring as this would not be used. You will be adding much more to your BA later on. A simple but fundamentally important item for group control. Simple instructions can be given at the beginning of the session (such as two short blasts for 'I need your attention' and on long blast for 'danger'.). Keep the whistle on a cord necklace but larks-foot it to the shoulder strap of the BA so it is always with it and never forgotten. On a necklace the whistle can be 'handed over' to your assistant like a totem of responsibility for the group, should an incident occur, while you deal with the casualty. A cheap and cheerful waterproof digital watch strapped to your other shoulder strap is always at hand and less likely to be scratched or damaged than being on your wrist. Whichever you choose, keep them in the pocket but on a cord long enough to have full reach when you are holding it. Ideally, tie it off to the small plastic clip commonly found inside the pockets of BAs; should an entanglement occur, a sharp tug should be enough to release you. As well as your first aid kit which will be kept in your kit bag, it is worth having a couple of items with you. 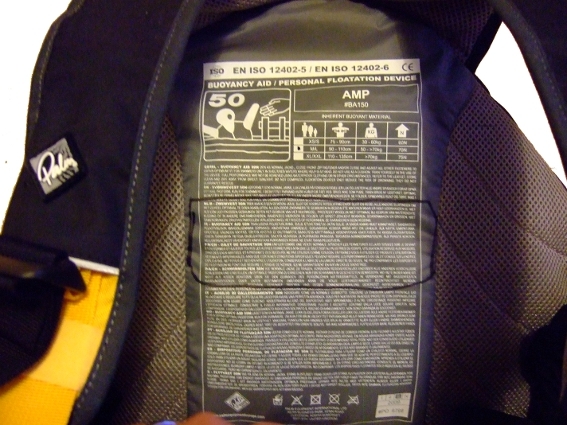 Storage space is very limited on a whitewater BA but less of an issue on touring BA. The types of injuries sustained Coasteering can range from the highly probable but low severity 'barnacle rash' through to the - hopefully - less probably yet highly severe head, neck and pelvic injuries. A Trauma Dressing such as the Israeli style bandage is ideal; double bagged so completely waterproof and vacuum packed to reduce space. This high stretch, 15cm wide bandage will apply enough pressure to limit serious bleeding and large enough to support joint injuries. Cling film has been touted as the great revolution for remote first aid for nearly 20 years; original used for burns in a clinical setting it has become common place in outdoors first aid kits being almostcompletely sterile, airtight and non-stick. It is also able to shape to the contours of the body and - while one layer is very delicate - several 'wraps' can immobilise most bone / joint injuries. However, a 12 inch roll is not a convenient size to carry an attempts to cut a roll in half result in fusing the cut end which prevent it unrolling easily. Even uncut, the edges become squashed and torn meaning every attempt to unroll a nice wide sheaf ends in frustration. Stretch Wrap (available from packaging suppliers) seems to solve all of these problems being only a few microns thicker, available in 6 inch rolls and on a tube wider than the film so the edges of the film are preserved. There are several issues which need to be considered when using cling film - read more about this remarkable stuff here. Again, as well as the flares carried in the kit bag, if you have space available consider carrying a small flare such as the Day & Night Flares such as the Pains Wessex Mk8. Pains Wessex changed their design recently with the Mk8 which, at 190mm might be a bit too long for most BAs. It may be useful to bring a 120cm or 24cm sling with a large wiregate carabiner (something like the Palm Whitewater carabiner ). A short sling is useful for lowering down to help a person out of the water or draping over a rock spike for an extended hand-hold. The sling can be clipped to a nervous swimmer or someone in difficulty for a short tow. Remember to only use equipment you are have experience in using and that have been agreed by the employer or organisation you are working for. A SAM or any other similar malleable splint is ideal for the coasteering environment as it is small, light, adaptable and unaffected by water. The SAM Splint has been proven to be as effective (when applied properly) as a proprietary cervical collar. Read more here. WARNING - This process will invalidate the warranty on your BA and Real First Aid Ltd take no responsibility for any consequence of a reader following the instructions below. 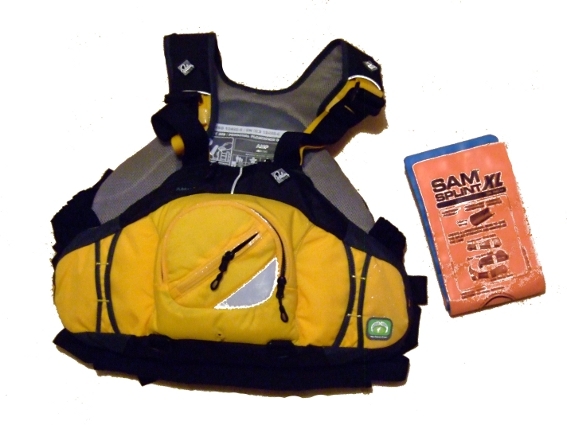 A SAM style splint can be 'stowed' in the back of a buoyancy aid quite securely, discretely and with little or no discomfort to the wearer. You will need to lay the splint on the inside of the BA and mark out an 'opening' that you will cu from the lining material. Place the splint so that the bottom edge is flush with the bottom of the BA and mark your opening about half-way down the length of the splint. If you opening is too high you might 'loose' the splint inside the lining of the BA. The opening will need to be quite deep to accommodate the thickness of the BA. Once the opening has been cut, cover the edges with plenty of Duct Tape to ensure they do not become frayed or the corners give way and tear under tension. Retrieving the splint does mean having to remove the BA so the wearer will need to be in a safe place before attempting to remove it.